The Morris & Essex Railroad Company was incorporated on January 29, 1835 and the line was opened on November 19, 1836. The New Jersey Railroad provided connecting service from Newark to Jersey City. 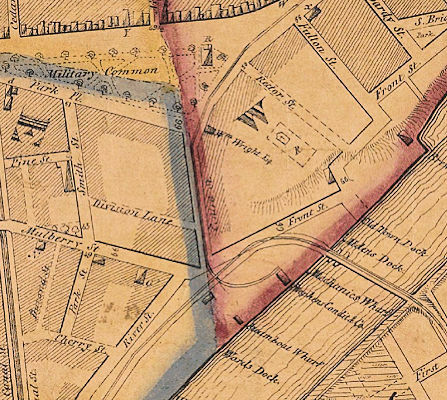 The line originated at the foot of Centre Street and the Passaic River, running west along Centre Street and then north on Broad Street until turning west where the current tracks are. The Delaware, Lacawanna & Western Railroad purchased the Morris & Essex Railroad on December 10, 1868. Extending from New York to Easton, Pa., 83 miles, passing through Newark, Orange, South Orange, Millburn, Summit, Chatham, Madison, Morristown, Morris Plains, Denville, Rockaway, Dover, Drakesville, Stanhope, Waterloo, Hackettstown, Washington, Broadway, Stewartsville and Phillipsburg.